Perhaps international change will be able to destroy the grounds for the myth that correct use of the word 'the' can only be understood by native speakers of English. However, today this word is used by native speakers of English with less consistency and more mystery than most non-native speakers want to tolerate. The articles 'a' and 'an' are easy to use correctly compared to the mysterious and rather noble-sounding 'the'. A frustrating aspect of understanding the use of 'the' is that children born to English-speaking parents have no difficulty with it by the time they enter school. Consequently, instruction is not given to them, nor is there sufficiently helpful instruction in grammar books. So we all leave school believing that the frequent and often beautiful use of 'the' in stories, newspapers, and poetry is the way to use 'the'. 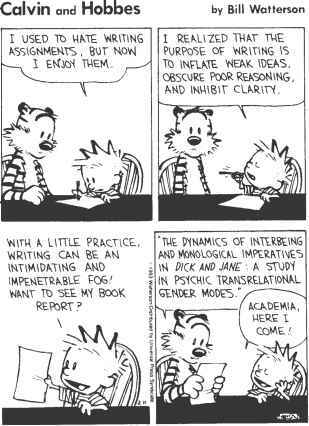 And then some of us become scientists and want to write in the style of science journals. The style of writing in scientific journals, especially in research reports, uses fewer 'the's than any other forms of writing. Many 'the's in English are optional, and science, luckily for you, takes the opportunity to omit as many optional ones as possible. In science today, this is somewhat of a problem for native as well as non-native English writers, but native speakers have 'an ear' for whether or not it can be left out and whether or not it should be left in. Probably you will need years to develop 'an ear', and the good advice of 'When in doubt, leave it out' may get you into trouble. Your most helpful source will be found in the spreadsheet information you gather from recent journal articles.